BANGKOK (AP) — Thailand's Queen Sirikit is being treated in a hospital for the flu, the royal palace announced Monday. The announcement from the Royal Household Bureau said Sirikit was admitted to Bangkok's Chulalongkorn Hospital on Sunday with a fever and a cough and received medication. She was recovering but remained hospitalized on the recommendation of her doctors. BANGKOK (AP) — Thailand's military government has emerged from the year of official mourning for King Bhumibol Adulyadej with a firm grip on power and in no apparent rush to hold elections it has repeatedly delayed during the four years since its coup. The five days of solemn and choreographed spectacle for Bhumibol's funeral last month was a mostly unblemished propaganda triumph for the junta that underlined its primacy and the sidelining of political parties. BANGKOK (AP) — The relics and ashes of Thailand's King Bhumibol Adulyadej were enshrined in the royal palace and two temples on Sunday, ending an elaborate five-day funeral for a widely revered monarch who reigned for seven decades. In the final act of the funeral ceremony, broadcast live nationwide and led by new King Maha Vajiralongkorn, Bhumibol's ashes were transferred from the Temple of the Emerald Buddha to two royal temples. 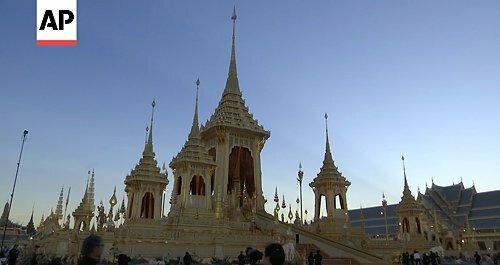 BANGKOK (AP) — Thailand's new king led a royal merit-making ceremony for his late father's relics on Saturday, the fourth day of an elaborate five-day funeral that caps a year of mourning. Buddhist monks from Thailand and abroad chanted prayers as King Maha Vajiralongkorn lit candles during the ceremony at the throne hall at Bangkok's Grand Palace. BANGKOK (AP) — The cremated remains of Thailand's King Bhumibol Adulyadej were transferred Friday to spiritually significant locations for Buddhist rites that will prepare them to be enshrined on the final day of an elaborate funeral that has transfixed the nation. Chinese President Xi Jinping stood alongside six other members of the new Politburo Standing Committee, the inner circle of Chinese political power, at the end of the 19th Communist Party congress in Beijing. In other images from the Asia-Pacific region this week, Thais held an elaborate funeral procession and cremation ceremony for King Bhumibol Adulyadej following a year of mourning. An Indian camel trader arrived with his herd for the annual cattle fair in Pushkar in western Rajasthan state. 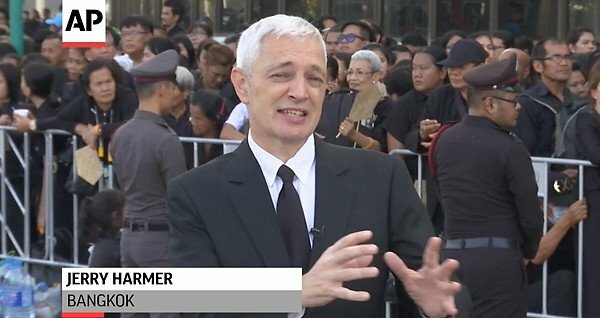 A strict dress code is required for journalists covering the royal funeral - haircut, clean shave and black suits. Here is AP photographer Kittinun Rodsupan before and after. SHANGHAI (AP) — Kiradech Aphibarnrat dressed in black and played with purpose Thursday in the HSBC Champions. Back home in Thailand, black-clad citizens solemnly ended a year of mourning for King Bhumibol Adulyadej with a series of traditional funeral ceremonies lasting five days. Kiradech wanted to do his part in a World Golf Championship in Shanghai. When King Bhumibol Adulyadej died last October, Thailand began a year of mourning, a national outpouring of grief capped Thursday by funeral ceremonies steeped in centuries of tradition. Many Thais loved the 88-year-old Bhumibol as a father, and the ceremonies were viewed by tens of thousands of mourners dressed all in black who thronged the streets of Bangkok, and by millions more across the kingdom who watched live on TV. Here's a collection of images chronicling the observances. BANGKOK (AP) — With solemn faces and outright tears, Thais said farewell to their king and father figure with elaborate funeral ceremonies that cap a year of mourning and are steeped in centuries of tradition. Thailand's King Maha Vajiralongkorn is participating in a religious ceremony to collect the ashes and relics of his father to be moved to special locations for further Buddhist rites. King Bhumibol Adulyadej was cremated in a specially built crematorium in Bankgok's royal quarter late Thursday as part of an elaborate five-day funeral capping a year of mourning. BANGKOK (AP) — The funeral of King Bhumibol Adulyadej is the culmination of a year of mourning for a monarch who became a father figure for many Thais during his 70-year reign. The elaborate ceremonies spread over five days are a once-in-a-lifetime event for Thais. The government declared a national holiday Thursday and businesses across the kingdom have shuttered. Even the always-open convenience store chain 7-Eleven closed so its workers could join the throngs of black-clad mourners paying their respects at shrines across the capital and beyond. But for some, Thursday, while remarkable, was also another workday. BANGKOK (AP) — The exactingly planned five-day funeral for Thailand's King Bhumibol Adulyadej will be governed by strict protocols for how the public and media conduct themselves that are as much about honoring the monarch as they are about controlling a delicate political moment. HUAY HOM, Thailand (AP) — Half a century has passed and the king is dead, but the villagers of Huay Hom still haven't forgotten the day Bhumibol Adulyadej descended by helicopter into their remote, impoverished mountain valley in northern Thailand and changed their lives forever. Bangkok returns to mourning colors, but what of the future? AYUTTHAYA, Thailand (AP) — Eleven Thai elephants, doused in powder to appear an auspicious white, stood at attention and trumpeted grandly at a ceremony Friday in Thailand's ancient royal capital, Ayutthaya, marking one year since King Bhumibol Adulyadej's death. Mourners clad in black stood in front of the elephants and fell silent for 89 seconds from 3:52 p.m., the official time of Bhumibol's death in what Thailand's Buddhist culture recognized as his 89th year. Then they sang an uplifting royal anthem and held pictures of Bhumibol above their heads while others prostrated on the ground. BANGKOK (AP) — Tens of thousands of mourners have been rushing to Bangkok's Grand Palace to pay their respects to the late King Bhumibol Adulyadej, as a period of nearly a year for his body to lie in state ends ahead of his cremation on Oct. 26. BANGKOK (AP) — Mythical creatures, angels and gods are coming to life near Thailand's Grand Palace, thanks to the tireless, devout and often volunteer work of artists and craftsmen. They are building a monument for a single moment: the cremation of a beloved king. NAKON PATHOM, Thailand (AP) — In a large workshop about an hour west of the Thai capital, fans ease the stultifying heat beating down on artisans hard at work fashioning ornate articles, large and small, to be used at the cremation of King Bhumibol Adulyadej (POO-mee-pon AH-dun-yaa-det). BANGKOK (AP) — Thailand's prime minister said Tuesday he will honor a request from the country's new king that several changes be made to a constitution that was approved in a referendum last August. Prime Minister Prayuth Chan-ocha told reporters that King Maha Vajiralongkorn Bodindradebayavarangkun told his royal advisers that he wished to have several articles about the monarchy amended. Prayuth did not specify what changes he desired, but said three or four points were involved. It is commonly said that celebrity deaths come in threes. But in 2016, famous people, especially musicians and actors, seemed to have died by the dozen. These high-profile deaths have drawn questions from millions of global social media users who have gone online to morn their passing. The seemingly high number of stars lost during the past year may simply be coincidence as a many legendary musicians and actors are Baby Boomers now reaching their 60s and 70s. Embracing Soviet-style communism, Fidel Castro overcame imprisonment and exile to become leader of Cuba and defy the power of the United States at every turn. The strongman's half-century rule was marked by the unsuccessful U.S.-backed Bay of Pigs invasion in 1961 and the Cuban Missile Crisis a year later that brought the world to the brink of nuclear war. After surviving a crippling trade embargo and dozens of assassination plots, Castro died in November at age 90, one of many notables who left the world stage in 2016. BANGKOK (AP) — Thailand's new king named an 11-member council of advisers on Tuesday, bringing in three new officials, including a former army chief and two representatives of the ruling junta. BANGKOK (AP) — Thailand's new king on Friday carried out his first official duty, attending a solemn religious ceremony to honor his father and predecessor who died seven weeks ago. King Maha Vajiralongkorn Bodindradebayavarangkun attended the Buddhist ceremony for the late King Bhumibol Adulyadej the morning after he was formally named the kingdom's new monarch, the tenth in the 234-year-old Chakri dynasty. BANGKOK (AP) — Thailand has a new king, with the country's crown prince formally taking the throne to succeed his much-revered late father, who reigned for 70 years. The new monarch, who received the title "His Majesty King Maha Vajiralongkorn Bodindradebayavarangkun," assumed his new position Thursday, according to an announcement broadcast on all TV channels. He will also be known as Rama X, the tenth king in the Chakri dynasty that was founded in 1782. BANGKOK (AP) — Thailand's new King Rama X is the tenth in a dynasty that dates back to 1782, but he will be judged by how he measures up to his revered father, who steadily steered his country into modern times in a 70-year reign. BANGKOK (AP) — Thailand's royal palace says Queen Sirikit is being treated at a hospital for a high fever and lung infection a month after the death of her husband, King Bhumibol Adulyadej. Sirikit, who has been staying at Bangkok's Siriraj Hospital, was transferred to Chulalongkorn Hospital, where specialists succeeded in bringing down the 84-year-old queen's fever on Thursday, the palace said in a statement Friday. It said she was able to "breathe well and eat." BANGKOK (AP) — The royal palace of Thailand says Queen Sirikit has been hospitalized with fever and lung infection, a month after her husband, King Bhumibol Adulyadej, died. Friday's statement says the 84-year-old Sirikit had high fever on Wednesday. She was admitted to Chulalongkorn Hospital and doctors succeeded in bringing down the fever on Thursday, when she was able to "breathe well and eat." BANGKOK (AP) — Thai authorities cracking down on online insults to the royal family following the recent death of their king pressed Google and Facebook for help as they shut down 1,300-plus websites last month — more than they had in the previous five years combined, according to records released exclusively to The Associated Press. BANGKOK (AP) — While tens of thousands of mourners have paid their respects to Thailand's late king at Bangkok's Grand Palace, where his body is being kept before cremation, a different kind of visitor appeared in front of the palace gates Tuesday. Some 200 mahouts leading nine, specially chosen white elephants and two white-painted elephants arrived at the palace from around the country. PHNOM PENH, Cambodia (AP) — A Cambodian official says authorities are working on a request from Thailand's government to extradite three Thais accused of insulting the monarchy. Foreign Ministry spokesman Chum Sounary told reporters Thursday that the Thai junta recently told Cambodia that the three Thais are believed to be in hiding in Cambodia. He says the Cambodian government "is processing the extradition request." In this photo by Sakchai Lalit, people buy lockets with the image of late King Bhumibol Adulyadej in Bangkok. The king's death after a reign of 70 years has triggered an intense outpouring of grief in Thailand, and people have been quick to purchase items or partake in activities such as alms-giving to honor his memory. Bhumibol died on Oct. 13 at age 88. BANGKOK (AP) — A massive crowd gathered in central Bangkok on Saturday to sing a special version of Thailand's royal anthem in honor of King Bhumibol Adulyadej, who died this month. A large field in front of the ornate Grand Palace complex was packed with black-clad mourners, as were all the approach roads. Police eventually closed the roads to traffic. BANGKOK (AP) — In honor of Thailand's late king, some Thais are collecting portraits of the monarch, some are purchasing commemorative banknotes — and some are getting tattooed. The death of revered King Bhumibol Adulyadej last week, after a reign of 70 years, triggered an outpouring of grief. Many Thais have been wearing black, praying at temporary shrines and taking part in activities such as alms giving. BANGKOK (AP) — Thailand's government said Tuesday it will monitor the social media activities of Thais abroad to see if they are posting insulting comments about the monarchy, which are punishable by stiff prison sentences, following the death of King Bhumibol Adulyadej last week. BANGKOK (AP) — Thais waited patiently in long queues outside government banks Tuesday to secure special commemorative 100 baht currency notes in honor of the late King Bhumibol Adulyadej. The note was released five years ago by the Bank of Thailand, but interest in it was renewed after the king's death on Oct. 13. People began lining up in the early morning at banks around the country to purchase the note, which was available for twice its face value at 200 baht ($5.71).